car maker's presence at the show in conjunction with dealer partner, Galpin Aston Martin of California. The unique Neiman Marcus Edition Vanquish Volante has been hand crafted by the company's bespoke customisation arm; Q by Aston Martin. Inspired by the iconic (1969) DB6 Volante currently owned by HRH Prince of Wales which featured in the Royal wedding of Prince William, Duke of Cambridge and Kate Middleton, this exclusive car debuted as part of the prestigious 2013 Neiman Marcus Fantasy Christmas Catalogue. 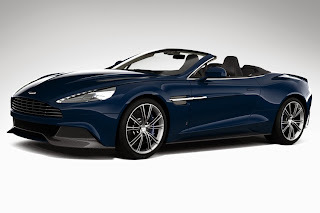 Production is strictly limited to ten examples and will form the first Vanquish Volante to enter the US market. "Since first being shown as a coupe, the Vanquish has quickly established its Super GT credentials and a loyal following amongst sports car enthusiasts worldwide. We are therefore delighted to launch the new Vanquish Volante, and in particular this very limited edition here at the Los Angeles Auto Show in conjunction with our dealer partner Galpin Aston Martin," said Julian Jenkins, Regional Director for Aston Martin the Americas. "Not only is this an opportunity for customers and enthusiasts to see a truly unique example of the Vanquish Volante but it also serves as a fitting demonstration in the degree of personalisation now possible via Q by Aston Martin."